On my way south for a break I stopped off at a few castles. The first of these, and arguably the most important, was the very ruinous castle at Dunbar, which I visited on Saturday lunchtime. I had been trying to arrange access through East Lothian Council, but it appears they were unable to locate any of their sets of keys to the gate – the castle compound is fenced off for safety reasons. 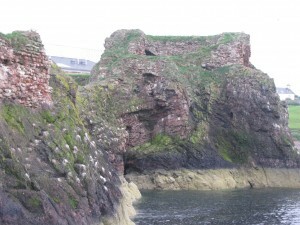 Dunbar Castle is built on a headland by the old harbour, and the surviving remains are part of a much larger complex which stretched out into what is now the leisure centre car park. There are only two parts which remain visible today, the inner castle area down by the harbour entrance, and the blockhouse, which is the part closest to the leisure centre. These two sections were linked until recently by a covered passageway which has collapsed. The angular blockhouse survives to first floor height (there were originally two floors of guns here) most of the way around its circumference, although the means of access to the covered passageway has vanished. 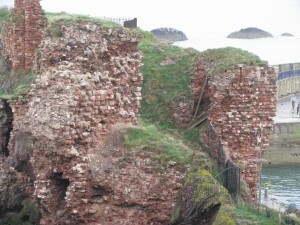 The covered passageway itself does not survive, although the access from the castle is still visible from below. It is by no means clear if this passageway was a bridge or a wall; the earliest photographs show an arch beneath, but this was rough masonry and may have been eroded. Access to the blockhouse is not possible without a dangerous climb up the cliffs, which I didn’t attempt as it was raining! The castle compound itself is fenced off with a metal railing, since the cliff edges and walls are not stable. From the harbour road to the east, it is clear that the natural defences of the promontory have been augmented with the building of a massive wall of red sandstone, which forms one side of a lengthy barbican-gatehouse. This barbican from the approach would have looked like a pair of tall square towers, with arrowslits and gunloops at the upper levels only. This is because for most of its height, the barbican was a shell of masonry around solid rock. Between the two “towers”, a steep set of stairs rises to the level of the hollow sections, which contained a series of small chambers on at least two levels, and then a further set of stairs to the courtyard area beyond. Access was provided from the western barbican “tower” to the covered passageway leading to the blockhouse. This was defended by a gunloop. Within the courtyard area, which was surrounded by a curtain wall (now vanished), was the great hall complex and most likely other subsidiary buildings. 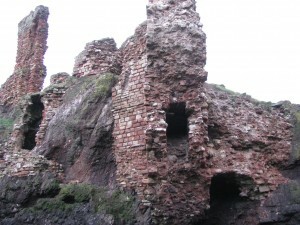 A section of the eastern gable of the great hall complex is what stands as a solitary reminder of the original height of the castle, which must have dominated the town and harbour. A further section, displaying armorial panels, has collapsed since being sketched on a number of occasions. 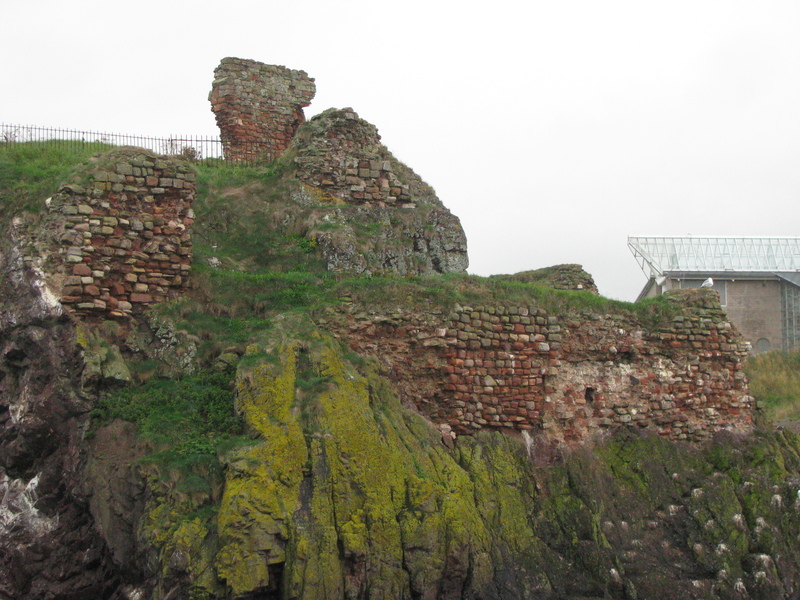 Other sections of facing masonry survive most of the way around the headland, showing that the augmented natural defences went all the way around the site. The northernmost end of the headland was destroyed when that harbour was improved, which contained further buildings and walls, and seems to have had at least one tower built upon it according to early sketches. This may have blocked the entirety of the harbour entrance, but this isn’t at all clear, and I wasn’t able to climb up the rock on the north side of the harbour to look at any evidence for building extending this far out, which would have been helpful. 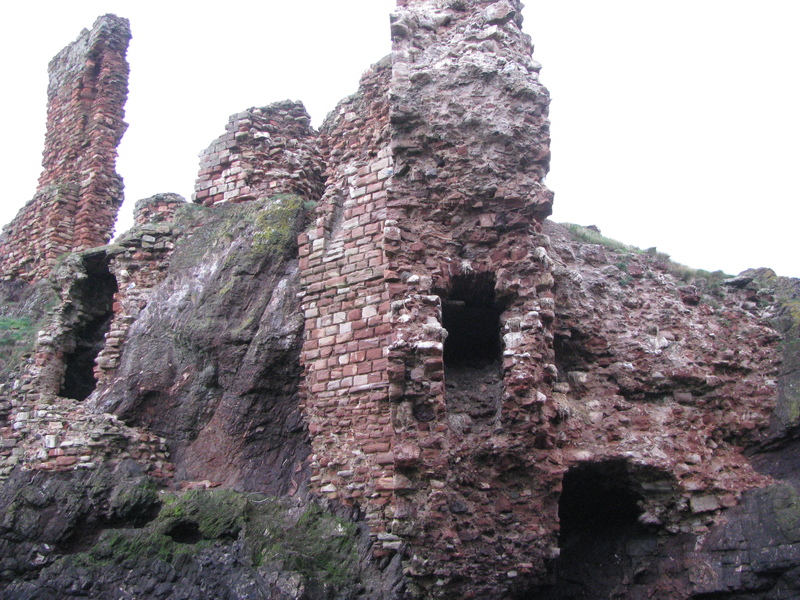 Masonry on the north face of the cliff face overlooking the harbour would suggest that the section blown up was fairly narrow, and tapered to a point with the tower at the end. 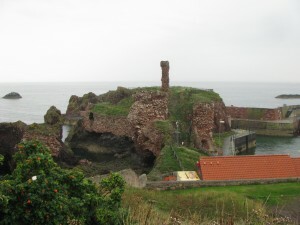 The castle is described as having been destroyed three times; by the Earl of Dunbar in the 1330s, by the Crown in 1496, and finally on orders from Parliament in 1568. It is therefore likely that the surviving remnants of the castle are 14th century at the earliest, although the design overall probably didn’t change much since conception, and may even go back to the 12th century. The style of the arrowslits in the barbican is quite late, possibly dating to the rebuilding of the castle c1500 and the presence of the large gunloops suggests that substantial remodelling took place in the 1530s alongside the construction of the blockhouse. In truth, I could see little that can date individual parts of the castle from the outside. Inside may be a different story. 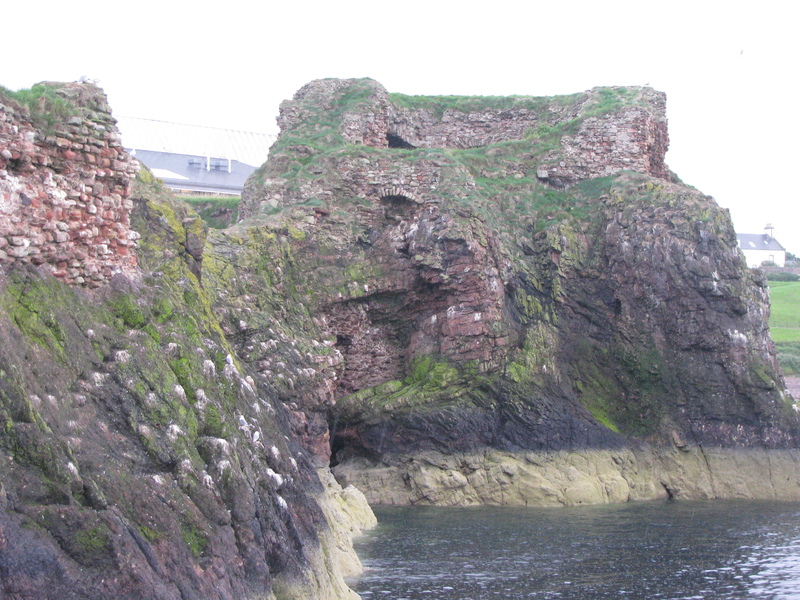 To the east of the castle, and at the other end of the harbour, is a D shaped artillery fort. This dates from the late 18th century and was apparently built to deter piracy after an American ship tried to raid Dunbar harbour in 1781! 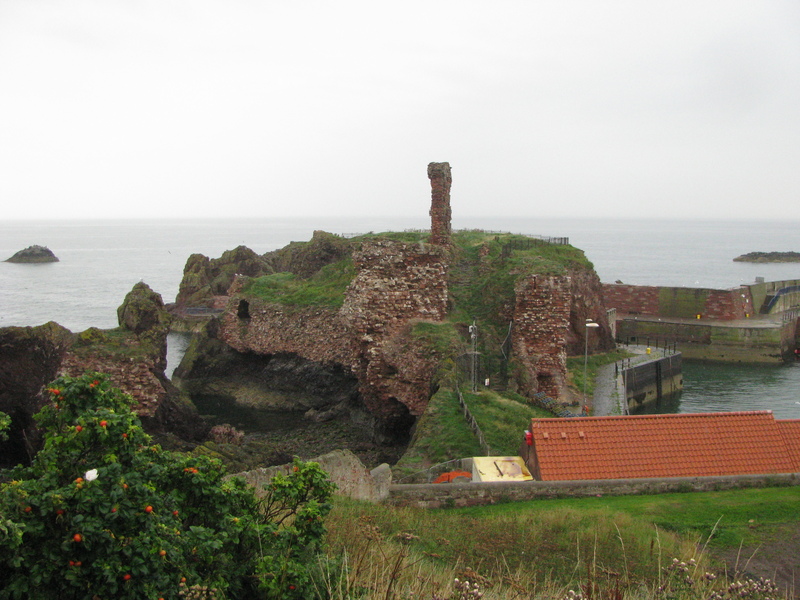 Dunbar is a lovely little town, and I thoroughly recommend a visit. Access to the castle is likely to remain a problem, but good views can be had from the leisure centre as well as the harbour area.